The creator of the standalone zombie survival game says that Microsoft has forced his hand. Dean "Rocket" Hall is working on a standalone version of his popular Arma II mod, DayZ, and has been for... a good while. Despite the numerous delays, Hall is looking ahead and says that the game will likely come to next-gen consoles after the PC release. After hearing the details of the Xbox One, however, Hall may only be bringing DayZ to the PC and PS4, considering Microsoft's indie-unfriendly policies. 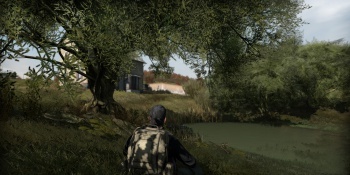 "We're happy to see DayZ on any console," Hall says, "but there is a... I guess one problem. The console needs to not charge for us to do updates and it needs to be indie title friendly." As it stands, the Xbox One is zero for two on those requirements: Microsoft's running strategy restricts indie publishing, and their policy of charging exorbitant fees for post-release patches has proved disruptive for even the most successful indie studios. Meanwhile, Sony has been expressing interest in getting DayZ onto the PS4 for months now, and Hall is attracted to their free patching policy - especially given the bug-ridden status of DayZ. "It's gonna take a long time for us to be able to iron this out and we don't wanna have to be paying ten, twenty thousand dollars - whatever it is - every time we wanna do an update." Hall did mention that he's not ethically opposed to an Xbox One port in the future, but it won't come without change from Microsoft. In other words... don't hold your breath.